reduced rates for 2013: High Season Euro 33.000 + VAT - Low Season Euro 30.000 + VAT per week. Launched in August 2009 this new 78 Alalunga has interior design completely revolutionized by the young designer Alessandro Vescia. Its engine with a pair of Caterpillar C32 1825 hp can reach a speed of 36 knots. This confirms the good characteristics of marine hull that has always characterized the Alalunga yachts. Large lounge, 1 owner's double room , 1 double VIP room, 2 twin guests room, kitchen, laundry, 2 crew cabins, 7 bathrooms. 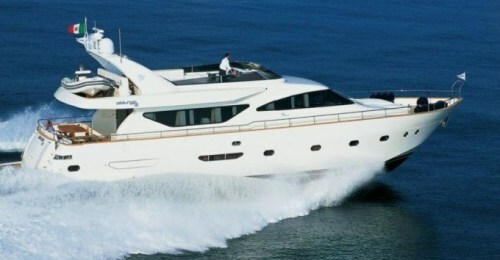 Special Offer on board Motor Yacht BANYAN!